In July this year, the UKUSA Agreement ’celebrates’ 48 years of operation. But there will be no fanfare, no ceremonies and no media attention marking the event. 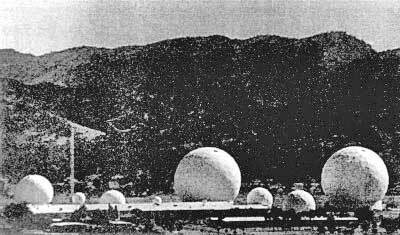 from one of the surrounding hills showing all eight radomes. The United Kingdom United States Agreement is one of the most important treaties ever entered into by the English-speaking world, and one of the least well-known. Desmond Ball (1990) has described the UKUSA pact as "the ties that bind", a treaty which obligates Australia to cooperate with the other UKUSA partners. To this date, it has never been officially acknowledged by any country. This article examines some of the significant organizations and projects that operate under the UKUSA pact. Despite the secrecy surrounding the agreement, quite a considerable amount of technical information has been made available through the work of researchers such as Desmond Ball and James Bamford. They have, however, been at pains to ensure that "there is no single mention of the subject of UFOs" (Good, 1987, p.412). According to Cooper (1991, p.196), between January 1947 and December 1952 at least 16 crashed or downed alien craft, 65 bodies and one live alien were recovered. Of these, 13 occurred within the borders of the United States. Research Ronald R. Russell reported that the British Deputy Directorate of Intelligence had 15,000 UFO reports on file from 1947 to 1954 (Good, 1989, p.31). The nature of the UKUSA Agreement has provided its organs with a unique autonomy and ability to pry into any avenue that proves interesting. Top-secret military bases such as Pine Gap, Nurrungar and Menwith Hill operate under the UKUSA pact. So, too, does the clandestine National Security Agency (NSA). Research conducted for the "Star Wars" project, now linked with the deaths of 22 defense scientists, is also conducted under the auspices of the UKUSA Agreement. The initial idea of the agreement was to carve up the globe into spheres of cryptological influence. Each country was assigned specific targets according to its potential for maximum intercept coverage. UKUSA brought together, under a single umbrella, the SIGINT (signals intelligence) organizations of the United States, Canada, the United Kingdom, Australia and New Zealand. In recent years, Japan, Korea and NATO nations have joined the pact. Prior to the UKUSA Agreement, an arrangement known as BRUSA existed. BRUSA formalized cooperation between British and US COMINT (communications intelligence) agencies. Although top secret, news of the UKUSA Agreement leaked quickly to Moscow through Kim Philby. As one American intelligence officer put it, the UKUSA Agreement was "like opening up a party line to Moscow centre" (Costello, 1988, p.516). Signatories to the UKUSA Agreement conceded to standardize terminology, code-words, intercept handling procedures and indoctrination oaths. Today, cooperation among pact members occurs in areas such as monitoring radio broadcasts, undertaking covert action and assassinations, overhead reconnaissance, human intelligence, estimates, security intelligence, counter-intelligence, training, seconding and equipment (Bamford, 1982, p. 308). UKUSA is a tiered agreement. The National Security Agency is called the "First Party"
The New Zealand Government’s Communications Security Bureau (GCSB) are "Second Parties"
Remaining countries are designated "Third Parties"
As the "First Party" to the UKUSA Agreement, the National Security Agency undertakes numerous clandestine operations. It is arguably the most significant intelligence-gathering agency. As the NSA was established without any official legislation, there is nothing, legally, that it cannot do. It is often referred to as No Such Agency! The National Security Agency can only be described as the biggest brother of all. Secretly launched by the Truman Administration on 4th November 1954, the NSA today controls over 2,000 electronic intercept stations, has a budget of over US$10 billion per year, and employs more than 130,000 personnel around the world - making it even larger than the CIA (Ball, 1980, p.33). The NSA operates more than three billion dollars’ worth of decoding machines, scramblers, computers and other forms of electronic equipment. The first Cray computer was built specifically to meet the needs of the NSA. There are 10 major departments within the NSA, including four operational divisions, five staff and support sections, and one training unit. The inner sanctum of the NSA is the Central Security Service (CSS), created by President Nixon in 1972. According to James Bamford (1982, p. 155), the CSS is the eyes and ears of America’s cryptological empire. "They are soldiers, sailors, Marines and airmen who sit in long rows with earphones, turning dials, activating tape recorders and tapping out messages on six-ply multicolored carbon paper." Through its electronic expertise, the NSA is heavily involved with the UFO phenomena - whether of extraterrestrial origin or not. "decipher alien communications, language, and establish a dialogue with extraterrestrials. The second purpose is to monitor all communications and emissions from any and all electronic devices world-wide for the purpose of gathering intelligence, both human and alien, and to contain the secret of the alien presence." In 1983, the NSA embarked on a project, code-named Platform, as part of its Big Brother-style surveillance network. Platform involved a plan to establish a worldwide computer network linking together 52 separate government computer systems used throughout the world. All of this information would find its way through the electronic superhighway back to the NSA’s headquarters at Fort Mead in Maryland, USA. Within the USA, Australia and the UK, the NSA can plug into every telephone call and message entering, leaving or transiting the country. In Australia, this is done through the US base, Pine Gap, and the new installation at Geraldton in Western Australia (Toohey, 1992). "Australia is investing heavily in modern high technology intelligence collection and surveillance systems." - The Hon. Kim Beazley, Australian Minister for Defense, 1987. The Australian Government consistently denies involvement with the UKUSA Agreement and the presence of the NSA in Australia. Australian governments, both Labor and Liberal, have pursued a "neither confirm nor deny" policy. On 19th April 1977, Malcolm Fraser declined to "provide information that might confirm or deny speculation" as to whether Australia was a signatory to the UKUSA Agreement, and whether the NSA operates electronic intercept stations in Australia (Commonwealth Parliamentary Debates, 1977). In November 1986, Senator Gareth Evans refused to "provide information which might confirm or deny speculation on the intelligence and security matters raised" by a question put by Senator Vallentine regarding the UKUSA Agreement (Hansard, 1986). Despite the denials, seven different Australian Government agencies are involved in UKUSA activities. They are the Office of National Assessments, ASIO, the Defense Signals Directorate, Services Intelligence Directorates, Joint Intelligence Organisation, and ASIS (Ball, 1990, p. 31). The UKUSA relationship is more than an agreement to coordinate intelligence activities and share the intelligence collected. The SIGINT aspect of the relationship is cemented by the presence of US facilities on British, Canadian and Australian territory; by joint operations within and outside UKUSA territory, and, in the case of Australia, UK and US staff at all defence Signals Directorate facilities. Much has already been written in NEXUS about the development of ’new warfare ideas’. According to Collyns (1976, p.81), Soviet scientists initiated discussions and proposals at the United Nations to ban the development of the new warfare ideas such as creating holes or ’windows’ in the ozone layer to bombard specific areas of the Earth with increased natural ultraviolet radiation which would kill all life-forms and turn the land into barren desert. Other ideas discussed at this meeting were the use of infrasound to demolish ships by creating acoustic fields on the sea; and hurling a huge chunk of rock into the sea with a cheap atomic device (the resultant tidal wave could demolish the coastal fringe of a country). Other tidal waves could be created by detonating nuclear devices at the frozen poles. Controlled floods, hurricanes, earthquakes and droughts directed towards specific targets and cities were also discussed. There is speculation that US bases are heavily involved in research involving many of these ’new warfare ideas’ as well as experimentation with the worldwide grid system. The most important US installation in Australia is the Joint Defense Space Research Facility at Pine Gap, near Alice Springs. Code-named Merino, Australian External Affairs Minister Paul Hasluck signed the agreement for Pine Gap on 9th December 1966. Its official role is to control signals and readout from Rhyolite satellites stationed over the Pacific. Three US intelligence agencies - the National Reconnaissance Office (NRO), the CIA and the NSA - are known to be centrally involved (Ball, 1980, p. 58). Pine Gap has a complex of radomes, a huge computer room and about 20 support buildings. A secret community of around 454 people live within the compound surrounded by a seven-square mile buffer zone encircled by a double fence, complete with 24 hour-a-day patrol and two and a half mile no-fly zone. Pine Gap is strictly under US control. Very few Australians are permitted in the top-secret sector of the facility. The Signals Analysis Section of the computer room is staffed exclusively by CIA and NSA analysts. "The United States has been carrying out continuous research into electromagnetic propulsion (EMP) at Pine Gap since it was established in 1966"
The Pine Gap transmitter sits very near the Tropic of Capricorn, and its antipode is very near the Tropic of Cancer on the centre of the Atlantic Ocean’s great dividing ridge. Pine Gap has what is believed to be the deepest and straightest water bore in Australia drilled beneath it. In September 1969, journalist Robert Cooksey (1969, p. 7) speculated that there was a nuclear power station at Pine Gap due to its high level of water consumption. Exactly opposite Pine Gap, on the other side of the Earth, is the Menwith Hill Station at Harrogate, England (Bamford, 1992, p. 208). Menwith Hill Station, code-named Steeplebush, is an exact replica of Pine Gap. Opened in September 1960, Menwith Hill has a staff of 400 and, like Pine Gap, is free from electromagnetic interference. Menwith Hill intercepts telephone and other communications to and from Europe and the United States. There is also a Circularly Disposed Antenna Array and a four-element VHF intercept antenna at Menwith Hill. Reports that white discs, about 30 feet in diameter with US Air Force markings, have been ferried into Australia inside large military transports which have landed at one or other of the two airports servicing Pine Gap (Deyo, 1992, p.24). The North West Cape transmitter is just slightly north of the Tropic of Capricorn, and its antipode is directly in the middle of the Bermuda triangle. It is almost certain that the earlier version of Pine Gap’s Very Low Frequency Transceiver, which is located at North West Cape near Exmouth Bay, Western Australia, was and still is used to transmit very powerful undersea electric currents to US submarines which trail long antennae behind them. It is also known that electricity transmitted in this way can be ’strong’ enough to recharge on-board high-voltage batteries known as plasma-dynamic storage cells (Deyo, 1992, p.24). On 25th October 1973, two US Navy personnel observed a UFO hovering near the restricted Naval Communication Station at North West Cape which is used by the NSA. "The object was due west of Area B, the location of the High Frequency Transmitter… it was completely stationary except for a halo around the centre, which appeared to be either revolving or pulsating… It suddenly took off at a tremendous speed and disappeared…"
In November 1969, construction began on the Nurrungar facility, code-named Casino. The location, known as the "Woomera Prohibited Area", is a small valley in South Australia and was formerly used for joint British and Australian weapons testing. Like Pine Gap, Nurrungar was equipped by Scalar Electronics and has a direct communications link with the Department of Defense in Canberra. Nurrungar is also reported to have direct radio and submarine cable links with the US (Ball, 1980, p. 65). IBM, TRW, Philco-Ford and Aerojet are heavily involved as contractors to Nurrungar. 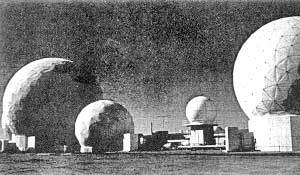 Known as a "Joint Defense Space Communications Station", Nurrungar station is inherently involved, to some extent at least, in the SDI programme (Ball, 1992, p. 79). Its role in SDI occurs through the Defense Support Program (Code 647). The DSP is a series of multi-purpose or integrated satellites placed at geostationary altitude and concerned with missile early-warning and nuclear-test detection. It also involves photographic and electronic intelligence. For further explanation, see Ball (1980, pp. 65-82). Between 1982 and 1988, 22 British defense scientists died in mysterious circumstances. Most of the scientists were employees of General Electric or its subsidiary, Marconi. Some were undertaking contract work for the Defense Ministry. Marconi specializes in simulation techniques both in space and underwater - processes fundamental to the Strategic Defense Initiative. Industry sources believe that many of the scientists’ work involved computer software programmes designed to guide or intercept projectiles, both undersea and airborne. All 22 deaths have been the result of bizarre accidents or suicides. Inquests into the ’suicides’ have recorded open verdicts, with authorities unable to explain the deaths. Ashhad Shariff, 26, a computer expert with Marconi Defense Systems, died in a car near Bristol. Shariff killed himself by pressing the car’s accelerator while a rope was tied around his neck and attached to a tree. David Sands, 37, computer expert a British defense contractor with Marconi Company Ltd, killed himself by driving a car laden with gasoline cans into an abandoned building in Surrey. Vimal Dajibhai, 24, a programmer with Marconi Underwater Systems, died after apparently jumping from a bridge in Bristol. The British Opposition has tied scientists’ deaths to research for the Strategic Defense Initiative, claiming that some were working on aspects of underwater vibration implications which have extensive implications for SDI, while others were involved in SDI-related research on computer-controlled radar. Signatories to the UKUSA Agreement have a longstanding interest in underwater activities. One project, Desktop, involves surveillance of a "mysterious Soviet undersea operation". The only official statement ever released about the project states that it is an extremely sensitive analysis programme dealing with "foreign activity." The code-word, Holystone, also designates highly sensitive undersea operations. Marconi’s history is closely allied with projects undertaken through the UKUSA Agreement. This began in 1941, under the BRUSA Agreement, when the USA delivered a model of the Japanese Purple machine (used by Japan to encipher diplomatic communications) to British code-breakers. In return, the British gave the US an assortment of advanced cryptological equipment, including the revolutionary Marconi-Adcock high-frequency direction-finder (HF-DF). As technical giants, General Electric and its subsidiary Marconi have provided much of the technology vital to projects undertaken through the UKUSA Agreement. As a leader in communications technology, the General Electric Corporation is the sixth largest company in the United States, with sales approaching US$56.3 billion in 1992. Its financial strength was originally backed by the Morgan banking house, and General Electric’s missile and space vehicle department was instrumental in the first Apollo mission. GE sold its aerospace division to Martin Marietta in November 1992. Martin Marietta produced the satellites for the Navy’s space project, White Cloud (part of the Classic Wizard ocean surveillance system), under the direction of the US Air Force’s Special Projects Office in Los Angeles (the cover for the West Coast office of the National Reconnaissance Office). Technical assistance was provided by the NRO, and E-Systems, Inc. which provided the electronic intelligence (ELINT) receivers and antennae for the satellites. For more than 40 years, the former Soviet empire has been the main target of intelligence-gathering conducted under the auspices of the UKUSA Agreement. One of the most significant projects undertaken through the UKUSA Agreement was the Strategic Defense Initiative (SDI), commonly known as "Star Wars". US President Reagan launched the Strategic Defense Initiative on 23 March 1983 to "render nuclear weapons impotent and obsolete". The heart of SDI called for the development of a "Peace Shield" using a global network of defensive devices in space, including powerful lasers and beam machines, to provide an umbrella of protection against a Soviet nuclear attack. Proponents of the New World Order credit the Strategic Defense Initiative with the demise of the Soviet Union. "I think it probably had something to do with it. ", he said. "The former Soviet Union was aware of the tremendous advances that the United States military was making, not just in Star Wars but in technology generally." And so, since the supposed end of the Cold War, SDI has been portrayed as some kind of menace that exhausted the Soviet Union morally, economically, politically and militarily. Gorbachev made any progress on disarmament absolutely dependent on the United States dropping SDI. Indeed, he agreed to unprecedented Soviet troop withdrawals and reductions as a trade-off for the termination of SDI. But a week after these concessions, US President Bush asked Congress to increase funds for SDI by US£4.5 billion in the next fiscal year. The media wondered how Mikhail Gorbachev would react to this slap in the face, but instead of criticism from Moscow there was accelerated cooperation: discussions regarding the development of a lunar base and a joint mission to Mars. On 4th May 1993, the acting director of the SDI organization, Major General Malcolm O’Neill, spoke to a Senate Armed Services sub-committee and requested US$3,800 million for SDI in the fiscal year 1994, $40million less than was appropriated in financial year 1993. On 13th April 1993, just days after the O’Neill request, Secretary of Defense Les Aspin officially terminated the SDI organization, renaming it the Ballistic Missile Defense Organization (BMDO). In a media statement, Aspin said that future research by the BMDO will focus on space-based sensors called "Brilliant Eyes", to be used for missile-tracking for enhanced coverage of lower and upper-tier theatre defenses, "Brilliant Eyes" would also help ground-based interceptors provide full coverage of the continental United States. THE REAL USES OF SDI? Far from down-scaling SDI, full funding was continued up until 1993 without so much as a whimper from the Soviet leadership. "have been aware for some time, first, that there is one more planet in our solar system and, second, that we are not alone". "Just think how easy his (Gorbachev’s) task and mine might be in these meetings that we held if suddenly there was a threat to this world from some other species from another planet outside the universe. We’d forget all the little local differences that we have between our countries and we would find out once and for all that we are all human beings here on Earth together." "At our meeting in Geneva, the US President said that if the Earth faced an invasion by extraterrestrials, the United States and the Soviet Union would join forces to repel such an invasion. I shall not dispute the hypothesis, though I think it’s early yet to worry about such an intrusion." "In our obsession with antagonisms of the moment, we often forget how much unites all the members of humanity. Perhaps we need some outside, universal threat to recognize this common bond. I occasionally think how quickly our differences would vanish if we were facing an alien threat from outside this world." The UKUSA Agreement poses significant implications for Australian sovereignty and democracy. In a world where US hegemony is now virtually undisputed, it is vital for us to question and make public the role of the UKUSA Agreement and the operations of US installations around the world. To this day, no government will acknowledge the existence of this treaty nor make public the activities and projects that place under its auspices. What is it that the signatories to the UKUSA Agreement have to hide, and how or what do they fear?